Don Gutoski's stunning image, 'A Tale of Two Foxes,' won him the title of Wildlife Photographer of the Year for 2015. 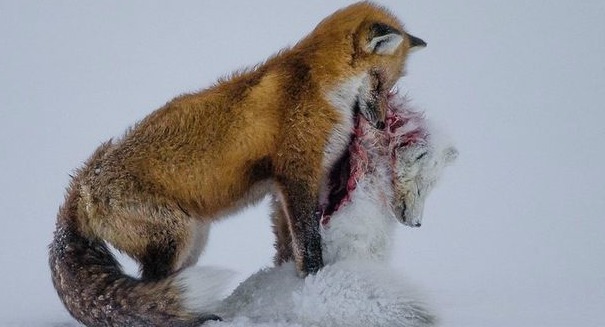 A Canadian doctor has been crowned the Wildlife Photographer of the Year for 2015 after snapping a breathtaking shot of a red fox dragging along a deceased arctic fox in the snowy woods of Manitoba. According to a report from CBC, Don Gutoski snapped the photo while visiting the woods of Northern Canada. Gutoski is an accident and emergency physician from London, Ontario. An amateur photographer in his spare time, his photo was chosen out of 42,000 entries from 96 different countries. The competition was produced by the Natural History Museum in London, who announced the winner on Tuesday. Gutoski snapped the photo, titled A Tale of Two Foxes, in Wapusk National Park at Cape Churchill, Manitoba. The park sits at a latitude where the ranges of both fox species intersect, and they often engage in deadly interactions. Gutoski noticed the red fox on the hunt and eventually saw the arctic fox he was after. By the time he reached the red fox, it had already killed the arctic fox and had begun to feed. The temperature was -30 degrees Celsius, and the red fox soon took his kill and retreated to a warmer spot.